Within my art I prefer to focus on asian influences, using both culture and media related aspects. Typically my art work consists of vivid hues, I like to challenge how far I can push basic color schemes. As an artist I prefer expressionism and choose to interpret vivid color schemes into different emotions. I am a new student at my school and I am thankful for Harrison in pushing me beyond my artistic limits and getting me involved with my local community. Koi fish symbolize good luck, abundance and perseverance. In Buddhism the koi represents courage and advancement. Koi fish can be located in Hollis Garden downtown. 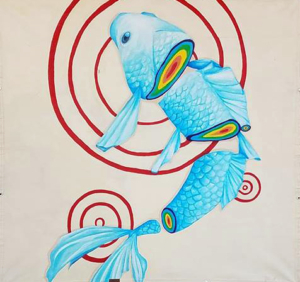 I chose to depict a koi, as they represent the advancement of the art community in downtown Lakeland. The cut pieces depict layers of color, parallel to the layers of effort it takes to make advancements in the community.